Originally posted on FiberFervor.wordpress.com (my old blog!). Learning how to kettle dye yarn can be overwhelming first. 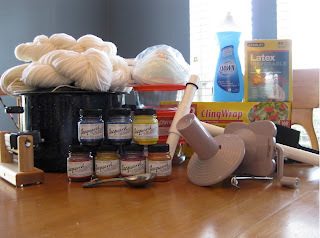 In this tutorial, I hope that I have simplified the process enough so that anyone can dye yarn in the comfort of their own kitchen. Please know that dyeing yarn does take a little practice. I highly recommend buying some cheap (100% wool) yarn to practice on. Knitpicks.com offers an affordable variety of yarn weights that you can purchase. Feel free to email me (fiberfervor@gmail.com) with any questions you may have. While I am not a pro yarn dyer, I have dyed many skeins of yarn. Some good, some not so good and some great! I really do feel that kettle dyeing yarn (esp. variegated) is sort of a crap shoot. However, the more experience you have, the more you know what not to do. Good luck and happy dyeing! 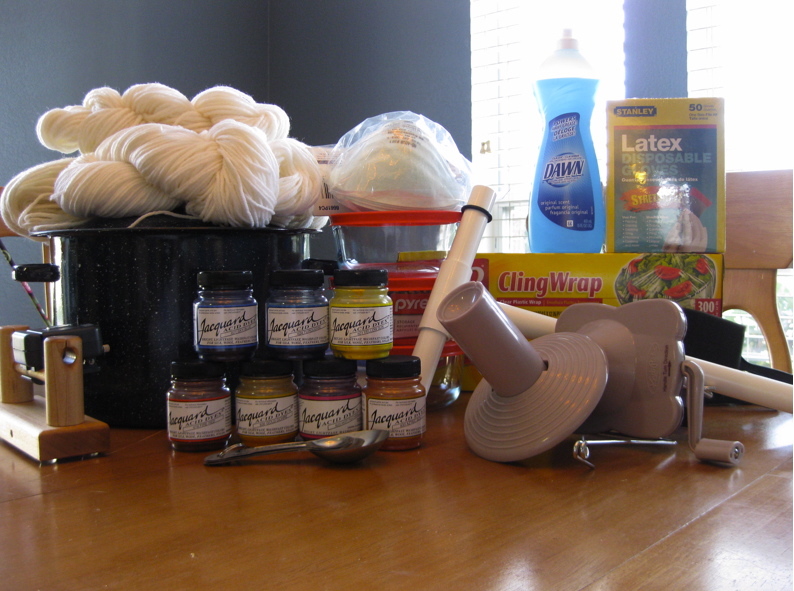 Materials Needed: Acid Dye, White Vinegar, Face Mask, Mason Jar, Gloves, Cling wrap, Measuring spoons & Cups. First thing first, you need dye stock solutions. Lay cling wrap down on your counter so you don’t ruin your kitchen counters in this process. Boil some water. Put gloves and mask on*. Get mason jar and add two teaspoons of the powdered acid dye. Fill jar (carefully!!!) with boiling water about 3/4 of the way. Add 1/4 cup of white vinegar. Put lid on tightly and shake. You want the dye to be completely dissolved. Set aside and make as many of these as needed. *You MUST wear a mask for this portion. 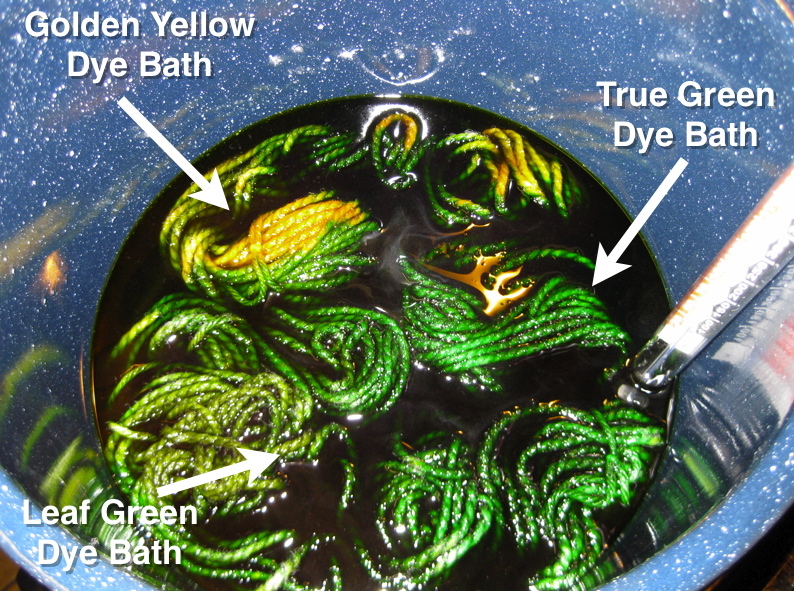 The dye can become air born and go into your lungs and cause irritation. Also, make sure no one else is around while you are making dye stock solutions. If other people are around, make sure they are wearing a mask as well. Yarn needs to be in skein form. Make sure to tie the yarn in minimum 2 places. Fill bowl with room temperature water. Add a couple drops of dish detergent. Submerge yarn in bowl and let soak for 30 minutes. 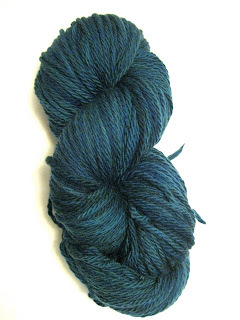 For a more marbled effect do not soak yarn in water prior to dyeing. While the yarn is soaking you can start preparing the dye bath. Fill measuring cup up with hot water. A little at a time, start adding dye stock. Make sure to keep track of what you are doing if you plan on duplicating the dye solution for future use. I usually add a tsp. of dye stock at a time. If you are mixing two colors, start with the lighter color. The more dye, the more saturated (darker) the end result will be. Use scrap yarn to “test” the color. Just remember that once the heat is applied in the actual dyeing stage, that your color will change slightly. Wring out excess water from the yarn that has been soaking. Place yarn in enamel pot. Slowly pour dye solution in. For solid color kettle dyeing you want enough dye to actually submerge the yarn completely. Around 10 cups of dye bath. Gently move the yarn around to make sure the all of the yarn has access to the dye solution. Sometimes, the yarn can form a barrier and not allow dye to certain parts. Turn stove on lowest setting and let the yarn “cook” for approximately 30 minutes or until the dye bath is exhausted (the water is clear). Let the yarn cool back down to room temperature (this can take a couple of hours!). 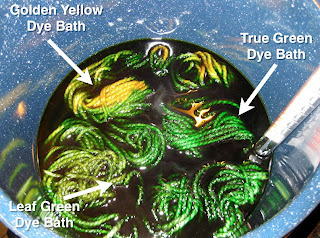 Once the yarn is at room temp., remove from pot and rinse in room temp water until no more dye comes off of the yarn. Set yarn aside. Fill sink up with room temp. water and add wool wash. Place yarn in sink and let it soak for 15 minutes. Remove, wring out excess water and place on a drying rack to dry. Get your colors ready. For this to work, you only want enough liquid in the pot to barely cover the yarn. And some parts may not be covered in the end and that’s ok. Think of your pot like a clock and pour each color in a section. Amazingly, the dye will (for the most part) stay where you pour it b/c of the yarn. The yarn sort of holds the dye in place. Some dye will mix with one another and this creates yet another color. When you do this, keep the color wheel in mind. You cannot mix colors that are opposite on the color wheel otherwise you will end up with a mucky brown. Have you tried dying in the microwave? I did this in grad school with silk, you need less dye and get super fast colors. Might be some tricks to microwave-ing wool. 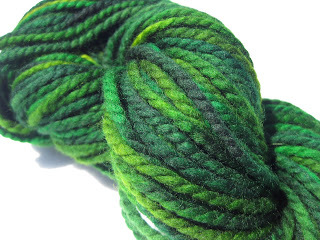 Also have you checked out the yarn and roving at dharmatrading.com? Very neat stuff. © 2014 All original images and text on this website are copyright and the property of Brenna Kotar. Simple theme. Powered by Blogger.